Add me to the THORP newsletter, too. Indisputably synonymous with anyone's recollection of the original surge of the British Oi! 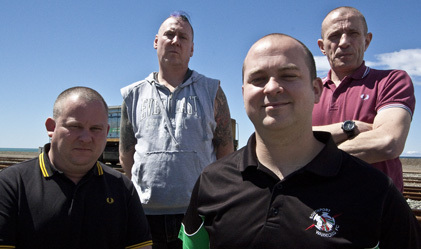 movement would have to be South London's working class skinhead heroes, THE BUSINESS. 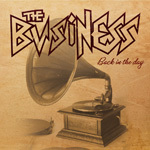 Shrouded in a mess of urban folklore, bombarded with tons of irrelevant controversy, and full of more perseverance than most new bands have in their little finger, THE BUSINESS are still here after 30 years. Having been instrumental in forming a musical aesthetic often referred to as 'pub rock', 'street rock', and 'punk n roll', THE BUSINESS are indelibly marked by tales of European football games, motorbike excursions, working class triumphs, bar room theatrics, factory life blues, and of course, the unavoidable anthems of the ever-scrutinized drinking and driving. Since forming in 1979, the band has releases more records than even some of the most long standing punk bands, toured all over the world, released records on labels such as EPITAPH, TAANG, BYO, TKO, CAPTAIN OI! and many more, as well as having Lars Frederickson (RANCID) produce one of their records and having shared a split release with DROPKICK MURPHYS. Although, the lineup has changed over the years, the message and the sound has not. Micky Fitz and the boys are poised to keep soldiering forward and keep the spirit of the streets rollin on into the future. Now, joining forces with Sailor's Grave Records, expect the legacy to continue with strength in 2010 and beyond. Contact | Advertise | F.A.Q.